Property Info: 3BR, 3 BR beach front condo with approx. 1800 sq. ft. 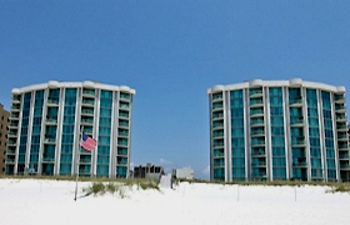 Fantastic beach getaway, don't miss this beachfront Perdido Towers Condo For Sale in Perdido Key Florida, priced at: $552k - low density community renovated with impact-resistant windows and doors - well maintained with exceptional furnishings. New AC unit replaced last year plus new living-room furniture and HDTV - this beach condominium home has excellent income potential. Amenities include a marina with boat launch on Ole Rover, fishing gazebo with fish-cleaning station, tennis courts, & boat storage, a large gulf-side pool with a spacious sun-deck space, owner's lounge with kitchen, ice maker, & exercise facility. A pristine portion of the Gulf Islands National Seashore is located on the eastern part of the island. Perdido Key State Park, a popular destination for visitors, offers unspoiled white-sand beaches in a subtropical climate - the perfect place for a family picnic while enjoying popular outdoor activities on the Gulf Coast - this resort community is a great place for families Experience popular Perdido Key restaurants like the Fisherman's Corner, Sea-n-Suds, The Crab Shack, Lillian's Pizza, etc. and enjoy some of the freshest seafood anywhere. There's no shortage of Perdido Key lodging options, from vacation rentals by owner and popular hotels nearby - plus a variety of resort property including beachfront condos, for anyone interested in their own slice of paradise.. Whether you’re ready for fun and adventure, a relaxing day on the beach, a real estate investment, or tasty cuisine - you can find it all on Florida’s Gulf Coast.